Excitement awaits. The 2019 Avenger 800 is an adventure every time you put it in gear. When you have a 30HP twin cylinder liquid cooled electronic fuel-injected engine leading the way, swamps, sand and mud are just sections of a big obstacle course waiting to be conquered. ENGINE: High-performance 30HP V-Twin cylinder EFI Liquid Cooled Engines deliver clean, dependable power for your Avenger in all seasons. ADMIRAL TRANSMISSION: This transmission uses some very complex gearing, including dual differentials on the output shafts so when steering, the braking force is not applied to the output shafts but to a steering differential which translates to a vastly different driving experience. While steering in high gear the output shafts rotate at a 3:1 ratio, yielding smoother, gentler steering events. Available in Classic High Torque or Standard. RIMS & TIRES: Steel Offset Rims with low-pressure 25 in. 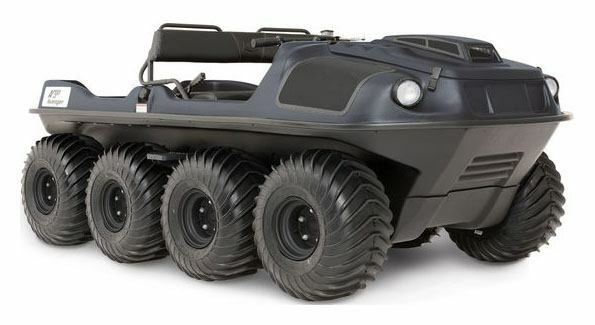 tires are custom engineered with a paddle design for amphibious propulsion through water and optimized traction on the most extreme off-road terrain. WINCH AND BRUSHGUARD: Pulling power for when you need it most. ARGO’s Warn winch mounts front or back to assist with high-angle extractions of equipment or debris. Available for each Avenger model as a genuine ARGO accessory with 3,500 lb. capacity.